What’s an update without a dog photo? This is my new Jack Russell mix, Carlton. I adopted him from the Cameron Dog Pound, the nicest one on the planet. He’s adapting quite nicely to our pack. We haven’t forgotten about the Rattlesnake house! In fact, things are moving along much better. Chris seems to have all the electric and plumbing stuff under much better control, as you can see if you watch the April 25 Facebook update below (if you’re on the home page, just click the more link). There are also actual walls with sheetrock on them in some of the rooms. Yay! That sure looks nice. Unfortunately, they ran out of the pre-purchased sheetrock and need to get more, so Mandi is putting together a BIG order for more supplies today. Of course, some things are on back order. Of course. Never fails. And you wonder why projects get delayed? Mandi was especially irritated to see that the nice, normal-yet-attractive bathtub she decided to buy is a special order that takes two weeks, but the fancy one with lights and gee-gaws that she realized was a bit over the top is NOT a special order. What the heck? They have one of those fancy ones no one ever buys, just sitting around, but don’t have any of the type most remodelers want? Hmm. As soon as the windows are measured one last time, the new windows will get ordered, too. That’s going to make such a big difference. Chris has found some really cool vents for the bathroom that are really easy to use, which we hope will make keeping the bathrooms free of dampness a lot easier, even in a house with little kids. In the April 24 video below (which also features cute dogs), he explains how it works way better than I would. All I know is I wish I had those in my house! I think Chris needs to have his own YouTube channel full of advice from the wise contractor guy. Anyway, thanks to him for letting us share his wisdom with you. See those gaps in the flashing? So did the bats. The Bobcat Lair always has some surprise for us. Here’s a story I also shared in my nature blog, The Hermits’ Rest. How many of you have had this to dealwith in your rehabs? “It’s not swallow time,” I replied, verifying the time on the handy Fitbit. “It’s BAT time.” I then briskly went out to see what was going on at the ole chimney. 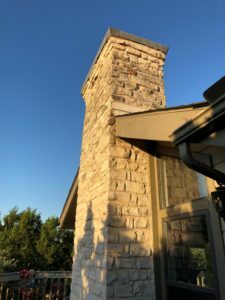 Sure enough, two sturdy-looking bats emerged from the flashing around the chimney…right where we’d been noticing “mouse turds” for a couple of weeks (to our credit, they looked more like mouse turds than the squirrel alternative). I immediately googled “bat guano—images.” Yep, that’s it, all right. Guano. There, now you can see the little holes better. Now, I’m not surprised to see bats here. 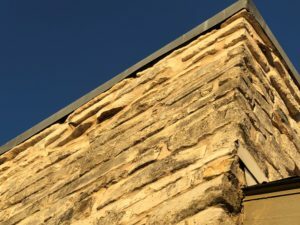 We had LOTS flying around our neighborhood at the Braesgate house, which was near the second-biggest Mexican free-tailed bat colony in the Austin/Round Rock area. It was incredibly fun to watch them flying around the cul-de-sac and eating bugs. Yesterday, I put on my very fresh new Texas Master Naturalist hat and started making phone calls. The hardest part about bat control is figuring out who is in charge. I talked to Floyd at the Milam County AgriLife Extension (because I knew him, and I didn’t know the Austin staff), and he said I should call Animal Control, but that I’d probably need to have a pest control company come out. He was right. After a nice chat, it was concluded that Animal Control doesn’t “do” bats. So, I called ABC Pest and Lawn, who get a lot of our money, thanks to owning so many houses. They like us. It only took three transfers to find out that we are in luck! Our pest control company has a specialist. So, Francisco the bat man is coming by later this afternoon to assess the situation. Anita and I will be there to take some pictures and stuff. Rest assured, we will endeavor to harm NO bats. They eat bugs! They are cool flying mammals! My hope is that they will be “rehomed.” Or something. Stay tuned for another installment tomorrow! 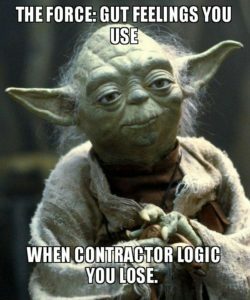 In parts 1 and 2 of this series, I wrote about how to find contractors and how to get them to view your project. For part 3, we will assume that you have received back all of the bids you requested from each contractor. I’ll be using hypothetical scenarios for this, to hopefully make this step a little easier. We will assume three bids for replacing 10 windows, and your budget is $15,000 (to be on the safe side). Let’s also assume for the sake of the example that $11,000 is a very fair price for this job in your area. Bid 1 comes from “So and So Contracting.” They wrote the bid on a tiny notepad piece of paper, and it is really hard to see how they came up with a bid of $4500 for the 10 windows. The handwriting is not clear, and you cannot read if they wrote up a bid or a to-go order for a restaurant. They also have requested full payment before working begins. Bid 2 comes from “This Guy’s Construction,” and it is typed up, clear, and easy to read. 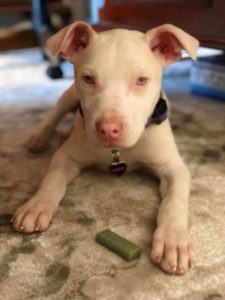 It has all the proposed labor and materials listed with an estimated cost, their bid comes in at $9,000, and they expect an 80% payment up front. Bid 3 comes from “Another Construction Company,” and this is a standard form from the company that has the details of the job handwritten into the blanks provided. Although it is handwritten, you can understand it, and the writing is clear. This bid includes everything that Bid 2 includes, but this bid comes to $10,500, and they expect a materials payment of 1/4 of the proposed bid up front. 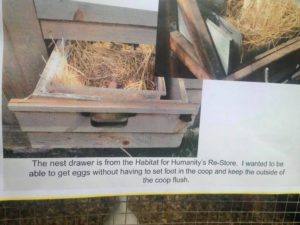 Here’s one of the chicken house ideas from the tour. That’s right, we all share one home! It’s our planet! I bet you knew that. All the Hermits celebrated Earth Day in our own ways, over the weekend and we hope that you stop for a minute and remember where you live in the really BIG picture and thank your mother today. Carol and Russell toured some snazzy urban chicken houses at the Funky Chicken Coop Tour Austin. They are way fancier than Sue Ann’s chickens’ abode! They ranged from a huge yard to a tiny one that also had goats! Sue Ann celebrated Earth Day in Rockdale, Texas, with her Master Naturalist group. They had a big set of exhibits, with lots of fun giveaways, like rain gauges and home-made bird feeders. Sue Ann got to eat brownies made of beautyberry fruit, and bought a really cool book on finding things to eat in your surroundings, called Cycles of Foraging – A Book of Days. The author, a young man named Sean Wall, was on the radio to promote it, along with the VP of the Master Naturalist group. It was a fun day! 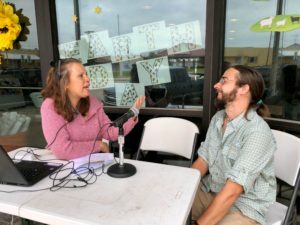 Author Sean Wall is interviewed by Jen Coleman for KRXT radio in Rockdale for Earth Day. Lee looked at birds, Mandi baked a very colorful cake and then headed to the Ren Faire, and Anita researched an interesting group of lizards she found while enjoying the smell of jasmine that drifts across our neighborhood. The point is, we can all enjoy our planetary home and honor it in small ways! Hey, fellow fixer-uppers! Our work honors the planet every day, because most of us recycle old homes and make them appealing to buyers. Many of us even recycle materials as much as we possibly can. We can always help the planet by carefully disposing of paint and other toxic materials and trying to recycle as much as we can when we demo fixtures. So much can go to the Habitat for Humanity folks and be used by someone else. Why not? Some of us even re-use parts of trees we cut down, or mulch plant debris and use it to beautify existing plantings. Any other ideas? Earth Day is every day! On Friday, I gave some ideas for how to find a good contractor. Today I’m sharing how to get bids on your project from the list of potential contractors you selected. Call and schedule appointments for the prospective contractors to meet you at the project site and ask them to “bid the job.” This just means that they will look around, talk about what you want, discuss what they see, measure areas, think about materials needed, propose a time frame, and discuss what kind of budget you are on. It’s smart to iron out right now who will provide and deliver materials, and who will take care of fees associated with that if they will pick up the materials. First thing to notice is whether they arrive on time. Of course weird things do happen sometimes, so if they are late, ask them why. If they had bad directions or had vehicle trouble, did they call and notify you of this? 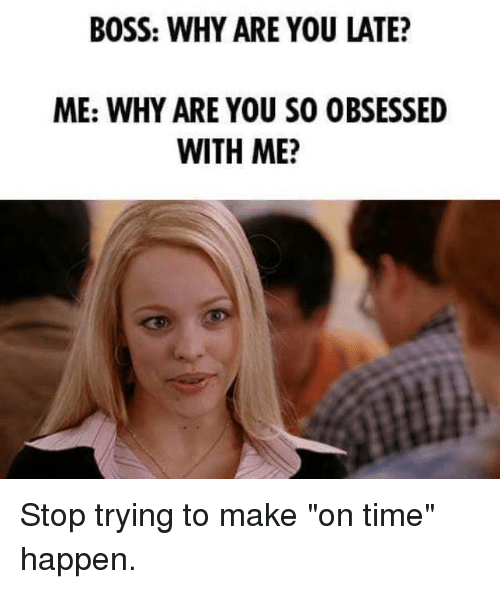 Personally and professionally to me, if they do not respect the timelines of an appointment for a job, can I trust them that when they tell me they will be finished with the job by a certain date that they truly will be? 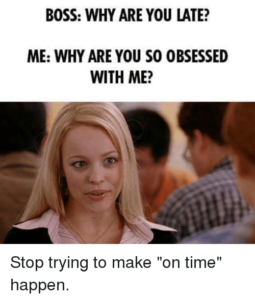 Arriving late to bid a job also shows me that they do not respect my time and schedule, and this will be two strikes against them off the start. I give 30 minutes, and I will call them. If there is no answer, they have 10 more minutes. If they show up after I leave, they have wasted their time, but no more of mine will be wasted. I have not had to do that so far [Sue Ann and Lee have], but that is my policy. Ask them to also bring names and numbers of references (three or four is good) of people they have worked for that you can contact. You can also request any pictures they have of their before and after jobs. A truly competent and good contractor will be happy to show you their hard work, and for you to have references. If they seem to shy away, or would rather just tell you about them, citing excuses as to why that customer would give a bad review, then I would suggest politely informing them that the project may not be a good fit for them. This is your money that you are spending, and if the job is not done well, you will foot the bill. 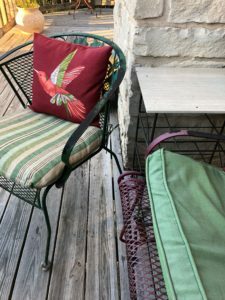 Even if you take them to court over a bad job and win, you will still have to hire another contractor to come in and fix the mistakes which will cost even more than the original job did to begin with [Sue Ann knows this first hand]. Be wise with your money, and do not be afraid to turn down a contractor if you do not get good references or have positive feelings about them.